Stepped out on the back porch this morning: 6:30 a.m. and it’s 74 degrees and an accompanying 93% humidity. Not a shocker, though. It is mid-May and that’s how we roll. The thunderstorms should be rolling in any time. Hopefully not before our youngest has her final elementary school field trip to see the local baseball team play. Ah well, this is when I am oh so grateful for a job inside with A/C freezing us out. This is why I am so grateful for Hubby’s job commuting 3 days a week instead of slinging concrete and laying curbing all day. This is why I am grateful to have started swimming in lieu of running…..although it will be cancelled due to thunderstorms today. The seasons of life, right? Well. Welcome summer. Time to bust out sprinklers, popsicles, sunscreen and beach paraphernalia. It’s going to be a hot one! The Hubby and I took a couple of days off at the end of the week before the kids went back to school. One of the days we went to the springs. I don’t know why we haven’t been before. It was beautiful, crisp and COLD and since it was a weekday….uncrowded. The swimming part of the springs is concreted off, similar to a swimming pool…around the edges but still plenty of rocks, sand and algae on the bottom and crystal clear. The swimming area is separated from the river with a lovely walkway with a jumping platform on one side and waterfall on the other side. The restaurant portion offers AYCE pancakes for about $5. Behind the restaurant are the remains of the original mill. Swimming and jumping in super clear and crisp 70degree F water. Sad to say the ole Fountain o’ Youth was bone dry. Joining Jen and gangster bloggers for the 7QTS this week!! Woop Woop! 1. This week I flipped back to old school style planner. Paper. Pens. Pencils. Still love my iPhone calendar, but I’m a tactile person and I need paper. My anxiety is decreasing already….this will do until I find something super purty…feel free to leave your suggestions in the combox! 2. This past weekend (Sunday) counts as the week start correct? We did a huge ole bed swap…our bunk beds to the neighbors (below right) and my girlfriend’s daughters trundle to our girls (below left) and my girlfriend’s daughter moved a futon into her room for hang/sleep/teen stuff (not posted)….can you say WINX3?!?!? 3. 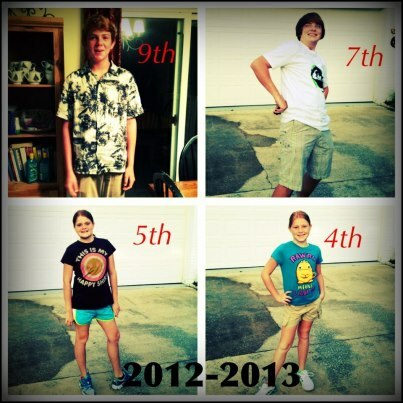 Back to school is right around the corner…..Our sophomore had orientation and our 6th grader as well. 2 down and 2 to go. Sweet structure is almost here. 4. I’ve been walking all week while our youngest has cheer practice for about 45 minutes each night (in addition to my morning classes) and am down 3 pounds. BooYA. Meh, the weekend is coming, all subject to change! 5. I’m taking one last road trip before school starts with my girls. We leave in the a.m. for a fun and packed weekend of friend visiting….hence the 3 pounds are subject to change. You feel me? 6. Oh no…..3 minutes over my time. 7. Have a great weekend!!! Back to school is coming quickly. For the kids it means earlier bed times, earlier wake times, scheduled days, band practice, cheer practice, homework. But….we have 3 more weeks. In that time we’ll* finish school shopping, stay up late, sleep in, enjoy the lazy days, soak up the sun and fun of summer. So go eat ice cream, play in the sprinkler, and take naps. Summer is still on. *we refers to the kids. Madre and Padre have no summer and yet….it’s still lazy and awesome! This view never gets old either! Summer is upon us and so there is a season (10 weeks to be precise)…in which we don’t have to routinely wake children up at the crack of dawn, I have so much time in the morning I am frequently “almost late” to work and the pace overall is just more relaxed. I love it. This summer has begun with our 11 year-old beginning her orthodontic treatment…beginning with the Herbst appliance. Let’s just say, yesterday was a little miserable for her. I made more smoothies and shakes in a day than I normally do all month. She’s a trooper though, and we are quite stocked up on Tylenol! Next week, our almost-10 year old will have her tonsils out. (If you have any pointers here, comment away, I’m alllllll ears). She’s had strep a ridic amount of times and we are ALL looking forward to getting these out. Not so much on the 2 week recovery period! WHAT?!?!??!? Which brings me to this: next week, post-op, I’ll be home with the girl and have some free time on my hands. Hoping my camera will be back so I can play with some tutorials, or maybe re-design my blog or maybe read a book….wide open. What are YOUR suggestions…do tell….and NOW…..I must get my rear in gear or I’ll be later for work!!!! Here we go, here we go, here we go…..first day of school pictures!!! Back to school for us in our neck of the woods…I know some areas wait until after Labor Day but here in the South we like to just barely dip our toes in the school waters and then…..have a little break. Kinda ease into it…nice and easy like. Whether you home school or work full-time and farm out the learnin’ to the public and private sector schools, back-to-school time is a grand time indeed. Don’t get me wrong, I love me some summer-time….and I don’t even GET a summer break. However, all good things must come to an end and now is the time…..so bring on the paper, pencils, 1-inch binders and glue sticks. We are ready to get back into the routine of things. Not as much fun, yet it’s a part of life and we’ll just keep movin’ on and looking back and wondering, “How in the HECK are we back in school ALREADY!?! ?”.